My name is Captain Doug Henderson, I’m a native to the Forgotten Coast of the Florida Panhandle. That being the case I had the opportunity to to be exposed to one of the premier inshore fisheries Florida has to offer. My home waters range from the Apalachee Bay to St. Joe Bay. That area includes Alligator Point, Carrabelle, and Apalachicola. 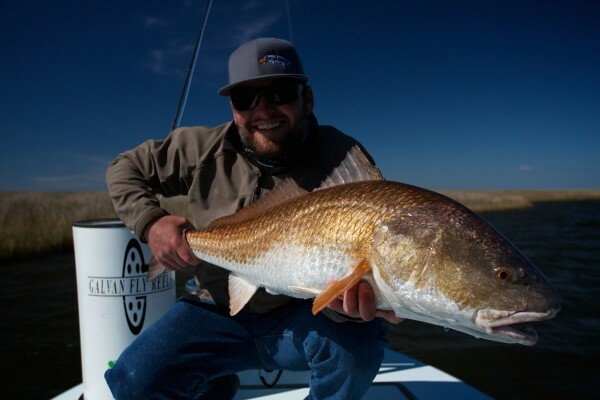 These waters are home to Species such as Speckled Trout, Redfish, Jacks, Cobia, and the famed Silver King (Tarpon). Growing up I used artificials to catch each of these species, most of all Tarpon. When I was 20 I moved to Jackson Hole WY to chase another passion of mine – Powder Snow, but I still found myself on the Florida Flats during the months of May and June… go figure. In Jackson I started fly fishing the main fork of the Snake and the South fork of the Snake in eastern Idaho. The very next summer was 2000 and along with a new millennium brought a new idea and way of fishing. I knew I needed to be hooked up to a Tarpon on a fly. This sport was new to Northwest Florida then and only one person was successfully Fly Fishing to swimming fish at the time. I gave him a call to book a day and he assured me that these Panahandle fish pound fly’s regularly. We left the Dock one late June morning with him saying to me “You ready to see some fish?” We dropped the hook and I got a few practice casts with the first 12 weight fly rod I’d ever held in my hands and here came the first string. I made a 50ft. cast and he said “LEAVE IT!” Strip…strip..strip..strip at this time I had striped in around 15 ft. of line when BOOM a 190+ pound Tarpon ate the fly and ripped every bit of fly line and a large portion of backing from the screaming fly reel. This all happened in several seconds and she was gone forever! With shaking arms and feeling weak in the knees from an unanswered adrenalin rush I looked up at the Captain and said, “This is it, I’m all in!” I bought a Skiff from him a few weeks later and have spent all my time honing my Fly Angling skills on the flats ever since. I have fly fished as an angler under guides all over the Gulf and I know how it can feel to be yelled at for missing a shot or not seeing the fish right away. That is not how things work on my boat. A day on the water with me will consist of instruction, encouragement, and adventure. Comradery and mutual respect for the wonderful opportunity we have to spend the day full of fun, laughter, and monster fish will be the goal. We will fly fish in some of the most pristine areas the south east has to offer. I really enjoy letting other people share in my passion for the flats and take great joy in teaching this art I have grown so fond of. Creating lifetime friendships and memories is my vision for Salted Flats Fly Fishing and I look forward to hearing from you.